This is the first in a three part series on revamping your wardrobe, frugally. 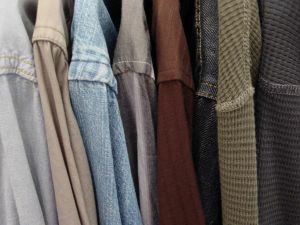 Today we’re looking at how to determine the kinds of clothes you need, for all the different roles in your life. For a long time I worked in jobs where my work wardrobe and my non work wardrobe were one and the same. I didn’t have different clothes for different occasions. I barely even had dress up clothes, and when I did, it always felt a lot like playing dress-up. Now however, it’s a different story. As I transition roles from teacher, to stay-at-home mom, to graduate student to (hopefully) well paid professional, my wardrobe has to transition along with me. Except… it’s not so easy to redesign your look and your wardrobe when you have limited time to go shopping, a limited budget to buy clothes and an even more limited interest in fancy clothes. I do need to change my wardrobe though, and I need to do so frugally. The first step in creating a fabulous, frugal closet full of clothes is to identify what kinds of clothes you need to wear. Why should you identify what kind of clothes you need before taking the plunge and delving into your closet? Because doing so will give you a road map of what to look for in what you have and what you need. This approach will save you money in the long run, as you don’t have to wonder if you need something and will use it, or just really want to buy it. I have five different category of clothes that I need. The first kind of clothes are the grungiest; those needed for painting projects or gardening. The hole-iest of hole-iest, they are clothes that I wouldn’t wear on any other occasion. One step up on the respectability ladder are clothes that I like to change into when I get home from school, or that I lounge around the house in on Sunday mornings. While I don’t mind taking the garbage cans out in these outfits, I wouldn’t want to be seen at the grocery store while wearing them, but they’re not bad enough to paint in yet. Public respectability is no longer an issue with my nice casual clothes, these are the sorts of clothes I can wear to a meeting with my child’s teacher or even to school some days. I also need to have business clothes, nice enough to wear to an interview or in a formal business environment. The final category is for fancy dress clothes, which I need every once in a blue moon; your life might be more glamorous than mine! The second step before buying is thinking about what you already own. I’ve gone as far as breaking down how many of each kinds of clothes I need. For example, on the far ends of the spectrum, I need just one grungy outfit (leggings and t shirt) and one nice little black dress that will carry me anywhere. I also only need one lounge-around-the-house ensemble, because, after all, when do I have time to lounge around the house? I need a much wider selection of casual and business wear however. There are five questions to consider when you look at your clothes. What you do after answering the questions is a judgment call. The goal is that you empty your wardrobe of clothes that you don’t wear. Frugal Fu asked herself similar questions and ended up donating 80% of her wardrobe to the Salvation Army. On Simplicity describes four other methods of cleaning out your closet. My Two Dollars shares how to let go of those old clothes. This is the first in a three part series appearing each Monday. Next Monday we will look at the elements of a frugal wardrobe and at the different pieces you need in each category. Stay tuned for the next two installments, or better yet, subscribed! I am really excited about this series. I had been considering doing something similar. I am all about looking good while being frugal. Great series, thanks for including me! I have never thought about the need to have a “grungy” category. 😀 It usually happens that my “lounge arounds” become “grungy” over time, after some horrific housework accident, etc. I like this idea, though. Great series!! I’m planning to undertake a wardrobe update of my own soon, and this will give me both a plan and motivation – Thanks!! I’m looking forward to the rest of this series. I’m trying to improve my professional wardrobe because even though one doesn’t have to look good in libraries I feel it improves my image…plus it makes me feel better about myself. At this point, too, making a good impression is much more important because I’m so young and don’t have the automatic authority of experience. Great post! I love your categories for types of clothing. I look forward to the rest of the series! I'm actually doing a series on organizing wardrobes this week too! Would it be okay if I were to link to your post at the end of the week when I wrap it all up? You've got some great tips here that I think my readers would appreciate. Link away! And send me the link too, and I'll add it to next week's post, or the last one. I was in a transition time this fall too. I went from a job where no one ever saw me and I could wear anything, to a job where I often have outside meetings and events. This seems so obvious now, but I started by assessing what I already had. I tried on most of my nicer cold-weather stuff and then I was able to shop with specific things in mind. I'm still working on building my more professional wardrobe, but it feels a lot more purposeful. I think it's also about having your clothes project the image that you want them- and you- to project. Are you young and haphazard or young and professional? Even if your job doesn't require you to wear professional clothes, are you professional in your job? That's what your choice of clothing says about you. Great series! I agree. . .I like the advice to dress for the job you want, not the job you have. At my school, I could easily teach in only nice casual clothes, but I choose to wear more business attire since that’s what most of the people in administration wear. These tips are fab. I am linking to this! What a great topic to write about! As always, there’s something valuable in there for everyone, anyone. Great series, can’t wait for the next installment. You are so right that we should dress for who we aspire to be not who we are now. I did a post about personal style that might tie in well, the link is http://www.theleantimes.com/?p=58. I am planning to do a Blog Roll can I include both your sites? I love the food one. I eliminated a lot of my "don't ever want to be seen in" and work clothes (painting, cleaning, etc.) by putting them in a storage container. When I am ready to do outside work or painting I just reach into the container. They are folded neatly inside. No need to clutter up the closets. They are kept in the storage area with other cleaning items. This works really well and if anything happens to them (rips, spills, etc.) who cares? My husband also has his storage container with work clothes. When they outlive their usefulness, the softer items like t-shirts and shirts become cleaning rags or car washing rags which can be cut up and rewashed. Good for the environment too. No paper towels allowed. Previous post: The Best Cake Recipe. Ever.